Mulch is a protective covering, usually of organic matter such as shredded hardwood, leaves, straw, or peat, placed around plants to prevent the evaporation of moisture, the freezing of roots, and the growth of weeds. Conserve moisture in the soil. Prevent weed growth by keeping the top of the soil dark. Cool soil surface and stabilize soil temperature. Improve aesthetics of a landscape and add to property values. Reduce heaving (plant roots forced upward out of soil) of small plants as a result of alternate freezing and thawing of the soil in autumn, winter and spring. Add organic matter to soil. Reduce soil erosion on slopes. Keep fruits, vegetables and flowers cleaner due to prevention of rain splash. Reduced moisture loss in summer by 21% compared to bare soil. Delays soil temperature in winter from reaching the freezing temperature by two days when compared to un-mulched soil. 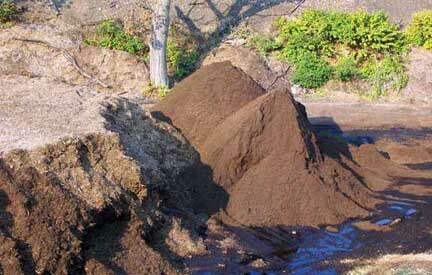 Organic mulches decompose in time and enrich and improve the soil. This results in increased aeration of silt or clay loam soils and added water-holding capacity of sandy loam soils. Mulching improves and stabilizes soil structure by reducing the effects of impacts from rain, people walking on the soil and cultivation, especially when wet. In short, mulch reduces soil compaction in all soils. Mulch is usually first applied in spring after the soil has warmed and begun to dry from winter rains and snow. Depending on soil texture, temperature and other weather conditions, this is usually mid to late spring. Mulching too early can delay drying of soil and subsequent root growth which is dependent upon sufficient aeration and reasonably warm temperature in the zone of root growth. A second application of mulch is often needed in autumn. For established plants, timing of the mulch application may not be as important as it is on new plantings. Frost heaving of small plants, especially those newly planted, occurs following alternate freezing and thawing of the soil in winter. To reduce heaving, which breaks roots, apply mulch following the first indication of frost in the ground. Mulching slows the thawing cycle and thus heaving. For established plants, water thoroughly in late autumn if the soil is not already moist, then mulch. The recommended mulching depth for organic mulches is 2 to 2.5 inches. At this depth, most mulches will accommodate the primary objectives of weed control, soil moisture conservation and temperature modification. Mulching depths less than 2 inches may not be effective in weed control; however, mulch applied 3 to 6 inches or more can lead to serious problems for landscape plants. A mulch that is too thick may severely reduce or eliminate drying and lead to water-logged soil, particularly during wet seasons or in heavy clay loam soils. Excess mulch applied right against the trunk of trees in the landscape leads to constantly wet bark and conditions favorable for disease development which can potentially damage the tree. When reapplying mulch over an existing layer of mulch, bring the total depth up to 2 to 2.5 inches. Do not apply 2 inches of mulch with each application or soon a depth greater than 3 inches will accumulate. Some mulches break down at a much slower rate. Keep this in mind for future applications of mulch.